Plot Summary: At the start of the 21st century, an interplanetary war broke out. Earth's ecosystem was damaged, and humanity was forced to flee the planet. In this new society, things that "disturb the heart" like music and art are forbidden. 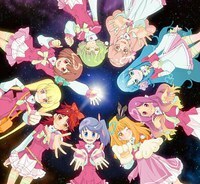 48 years later, a legendary idol group is resurrected as AKB0048. Labeled as terrorists, they must take up arms to defend their careers and their fans. Inspired by the popular Japanese idol group AKB48.